Wow, this is a majestic serving piece. 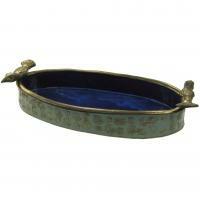 It is hand built and adorned with shades of blue glaze and gold luster. The two birds of paradise will symbolize peace and tranquility at any dining table and will compliment any home decor as well. This piece is food safe. Made in Covington, KY.
size: 20" x 10" x 5"